A lot rests on the shoulders of sales representatives as they work to earn the trust of their customers. The pressures of meeting sales targets while building long-term customer relationships is hard enough that they shouldn't have to worry about technology. As national bestselling author Bob Burg rightfully said, "Internalize the Golden Rule of sales that says: All things being equal, people will do business with, and refer business to, those people they know, like and trust." With Office 365 and Yammer, sales representatives can improve the way they work with customers. They can leverage expertise and resources available within their companies to better identify customer problem areas. They can demonstrate the value of their products by addressing customer use cases to meet their business objectives. They can spend less time working on documents and presentations and more time engaging with customers to address their concerns. And they can consistently focus on providing customer value regardless whether it's a face-to-face engagement or a web-based video conference. 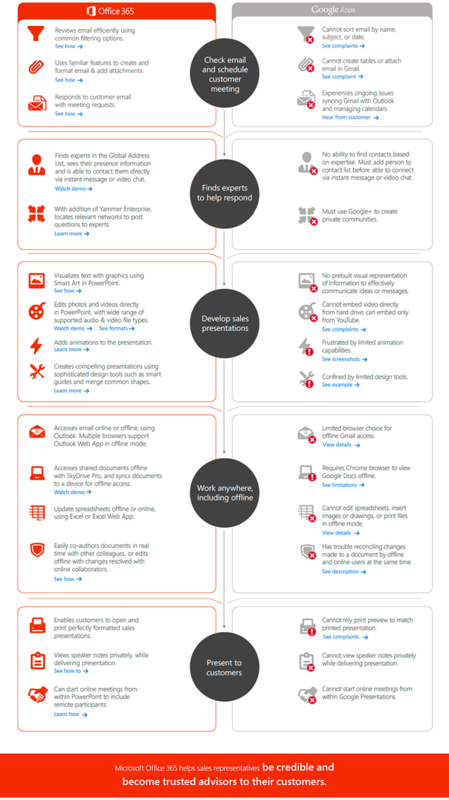 The infographic below shows what a day in the life of a sales representative is like using Office 365 with Yammer versus Google Apps.